The role of the medical assistant in the healthcare services industry in the United States has grown significantly over the past few decades and, according to the U.S. Bureau of Labor Statistics, that role will continue to expand over the course of the next decade or more. And what's true for the United States in this case is also true for the State of Oklahoma. For those Oklahomans considering a career as a medical assistant, it's important to know just what education and training they will need, as well as what they can expect when entering the job market. That's what this guide is all about. When you’re passionate about working in the medial field, a career in medical assisting might be able to get you started on the right foot. After earning a degree or certificate, you can go to work in a hospital, physician’s office, clinic or other health care facility and work one-on-one with patients, physicians and other medical office staff. But it pays to do your research first before settling on one medical assisting program because they’re not all built the same. To help students find the right school for them, we looked at the tuition costs, class sizes, career and counseling services, student reviews and other numbers. Check out the top medical assisting school in Oklahoma below. Hospitals, urgent care facilities, clinics and medical offices are just a few of the settings in which graduates will be prepared to work after completing the medical assisting program at Olklahoma City Community College. Graduates will be prepared to perform both entry-level clinical and administrative duties. Students benefit from a range of services during their academic journeys, including tutoring, IT support, career services, library and research services, counseling and transfer assistance. Student support services include mentoring, career and personal advising and academic workshops. How does Ohio define "medical assistant?" Oklahoma state law is silent when it comes to defining the term "medical assistant." A good working definition, however, is offered by The Free Dictionary: "a person who, under the direction of a qualified physician, performs a variety of routine administrative and clinical tasks in a physician's office, a hospital, or some other clinical facility." "Medical assistant" should not be confused with the term "physician's assistant," which is referred to quite often in the Oklahoma State Code and defined under the state's Physician Assistant Act, Section 519.2 as: "... a health care professional, qualified by academic and clinical education and licensed by the State Board of Medical Licensure and Supervision, to practice medicine with physician supervision." Is a formal education and/or training required to work as a medical assistant in Ohio? Oklahoma does not require that medical assistants working in the state complete any formal medical assisting education or training program. However, completion of some form of postsecondary medical assistant education or training course is highly recommended. No. The State of Oklahoma does not require certification for medical assistants. Additionally, Oklahoma does not register or license medical assistants working in the state. Yes. Certification is available to medical assistants in Oklahoma from a number of national certifying organizations, as described in the table below. 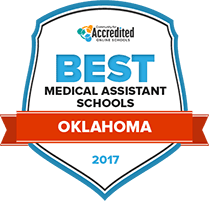 Certification of medical assistants in Oklahoma is entirely voluntary, but strongly recommended to anyone seeking a long-term career in the field. American Association of Medical Assistants (AAMA) Certified Medical Assistant (CMA) Successful completion of an accredited medical assisting program and practicum; and passing the CMA exam. Recertification requires completion of continuing education component. American Medical Technologists (AMT) Medical Assistant (RMA) Completion of requirements of one of four eligibility paths to sit for RMA exam; passing the RMA exam. Regular continuing education requirement for maintenance of certification. National Association for Health Professionals (NAHP) Nationally Registered Certified Medical Assistant (NRCMA) Graduation from an accredited education program, approved military medical training or two years of professional experience and passing of the NRCMA exam. Continuing education requirement for recertification. National Center for Competency Testing (NCCT) Medical Assistant (NCMA)1 Successful completion of one of four eligibility paths and passing of the NCMA exam. Recertification requires completed continuing education component. National Healthcareer Association (NHA) Certified Clinical Medical Assistant (CCMA)2 Completion of accredited training program or military or other work experience and passing of the CCMA exam. Continuing education required for recertification. Does Oklahoma state law detail specific job tasks that a medical assistant can and cannot do? 1. The service rendered by a physician's unlicensed trained assistant, if such service is rendered under the supervision and control of a licensed physician pursuant to Board rules, provided such rules are not in conflict with the provisions of any other healing arts licensure act or rules promulgated pursuant to such act;"
Greeting patients. Taking medical histories. Answering telephones. Preparing patients for examination. Updating and filing patient medical records. Drawing blood. Scheduling appointments. Preparing and administrating medications. Coding and filling out insurance forms. Assisting the physician during patient examinations. Oklahoma currently ranks among the lowest dozen states in terms of salaries for medical assistants. Keep in mind, however, that actual salaries depend on a number of factors, including specific employer, job duties and geographic location within the state. The table below compares annual pay for medical assistants nationally and in Oklahoma. As mentioned above, real salary figures are based on several factors, including job location within the state. The table below breaks down salary numbers for medical assistants by specific city, metropolitan and nonmetropolitan areas in Oklahoma. As with salaries, Oklahoma lags behind national averages when it comes to expected growth, coming in a full 10 percent lower than the growth rate predicted across the nation as a whole, as shown in the table below. Don't forget, however, that the projected job growth rate for medical assistants in Oklahoma is robust when compared to the projected job growth nationally for all occupations combined. Located in Norman, MNTC is one of the 29 technology centers that make up Oklahoma's public CareerTech System. MNTC offers course and programs aimed for high school students, college-bound students and adults seeking to advance their careers through vocational education and training. This is a 14-course program leading to a Medical Assisting Certificate. The program contains a small clinical component. Specific requirements of the clinical component vary by medical facility. OCCC is a public, two-year institution offering more than 80 associate degree programs. It is the fourth largest college in the state, serving over 28,000 students annually. Associate of Applied Science in Medical Assistant degree. This program allows students to take general education and support courses at OCCC while receiving prior learning assessment credit for medical assistant courses associated with CMA-AAMA, CCMA, NCMA, or RMA certification. Another CareerTech System school, Tulsa Tech offers courses and programs in over 75 subjects at its two locations: Health Sciences Center in Tulsa: and Owasso Campus in Owasso. Two certificate programs available: Basic Medical Assistant (Eight courses) and Medical Assistant with Phlebotomy (10 courses). Available on both school locations, but open only to high school seniors on the Owasso campus. The most prominent national organization for accrediting medical assistant education programs. The CAAHEP's website provides extensive information accreditation and a search tool for locating accredited medical assistant programs. The AAMA is the largest professional association of medical assistants in the United States. Its website offers a number of resources for both members and visitors alike, including student and career centers, as well as extensive information about the AAMA's Certified Medical Assistant certification. The Oklahoma Medical Board oversees the licensing of physicians and other medical professionals in Oklahoma. Although medical assistants in the state are not licensed, the Oklahoma Medical Board's website provides plenty of useful information about issues affecting medical assistants, such as scope of practice. The College Board is a non-profit organization whose goal is to prepare students for success in education and careers. Its Major: Medical Assistant web page offers a wealth of helpful information and advice on preparing for a career as a medical assistant. Government clearinghouse for information and data regarding the state of the medical assisting profession throughout the country. Hugely useful resource for statistics and info on salaries, projected job growth, education and training requirements, and much more.